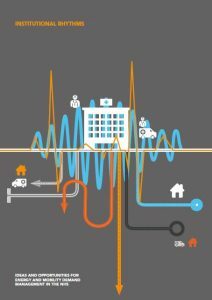 As part of the Institutional Rhythms project, we held a series of three non-academic workshops designed to bring together researchers and professionals working on issues of sustainability to co-develop innovative approaches to energy and mobility demand management in the NHS. 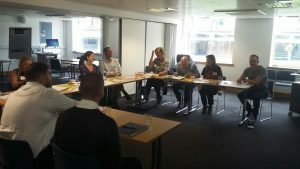 The working group consisted of 20 members including NHS sustainability leaders working in hospitals, businesses, and not for profit organisations. Organisations represented include Manchester, Sheffield, Leeds, and UCL universities; Airedale, Blackpool, Liverpool, and Leeds hospital trusts; Yorkshire Ambulance Service, Cumbria Outpatient and Patient Transport, Global Action Plan, Lancashire NHS Environmental Procurement, and the Centre for Sustainable Healthcare. Participant list and details here. The series of workshops and the working group’s activities led to the production of the research briefing paper: Institutional Rhythms: Ideas and Opportunities for Energy and Mobility DEMAND Management in the NHS which was presented to the Nothern England Health and Sustainability NHS Network as part of the final meeting. The first sticky problem tackled by the working group was the notoriously difficult to shape discharge process, the structure of which affects patient care and experience, but also the throughput and flow of patients through the hospital which shapes demand for resources including energy, travel, and consumables. The group examined discharge timings as an outcome of the interconnections, interdependencies, fixities, and flexibilities of working arrangements in the hospital and began to unpick some of the more historical interconnections and fixed timings that contribute to later, collective, and bottlenecked discharge times. This discussion will be feeding back into one of the partner hospital’s quality improvement programmes which are designed to shift and stagger the timing of patient discharge. The second sticky problem (which proved more challenging) was about patterns of movement of people and goods into and out of the hospital. The group discussed how the timings of working arrangements in the hospital, shift patterns and rotations, and delivery schedules established patterns of demand for travel, constituted congestion and problems with parking, and most significantly maintained a dependence on private car use. 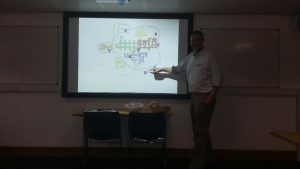 Whilst there is more work to do on this issue to challenge a strong narrative of travel choices, the working group helped to draw out a more detailed picture of how the hospital as an institution requires and orchestrates flows of people and goods. 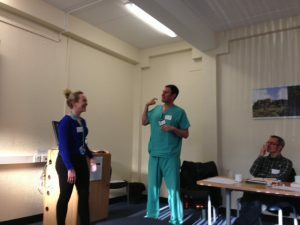 T his time the working group met at Airedale General Hospital and worked on developing outputs based on conceptual contributions taken from the project and two practical case examples presented by working group members. The Head of Environmental Sustainability for the Yorkshire Ambulance Service, Alexis Keech, presented on increasing demand for patient transport and on how the ambulance service was responding to these increasing pressures while the Head of Quality Improvement at Airedale, Jo Davy along with Consultant Anaesthetist Frank Swinton, presented their work at Airedale on improving patient discharge and hospital flow. The working group used these practical cases of managing working practices in hospitals in conjunction with ideas taken from the Institutional Rhythms project on temporal sequences, cycles, and coordination to imagine new opportunities for shifting temporal arrangements to steer demand for hospital services and patient transport. 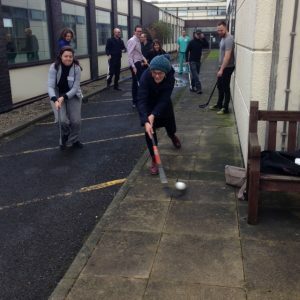 As always there was, of course, time for a (slightly unorthodox) game of floorball! 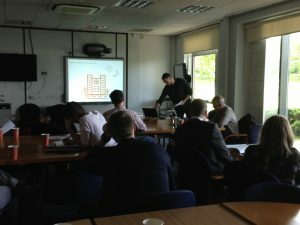 The final event was held in collaboration with the Nothern England Health and Sustainability NHS Network. Professor Greg Marsden, Director of the Institute for Transport Studies at the University of Leeds introduced the DEMAND Centre’s research and Stan presented the outcome of the working group’s activities, the research briefing paper: Institutional Rhythms: Ideas and Opportunities for Energy and Mobility DEMAND Management in the NHS.